RM Sotheby’s secured a private collection of 42 Porsches to be sold ‘without reserve’ at sales in 2017. 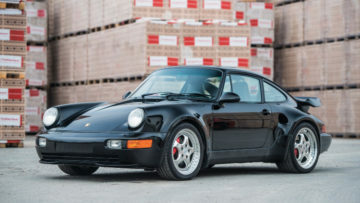 The Paris auction in February features 13 vehicles from the group, highlighted by a one-of-29 Porsche 959 S and a delivery mileage 996 GT3 RS and a one-of-17 964 3.6 Turbo S.
RM Sotheby’s announce that it will offer 42 Porsches from an exceptional Swiss collection ‘without reserve’ across a series of its global auctions in 2017. The first group of motorcars from the collection – a docket of 13 vehicles – are bound for RM’s Paris sale. Here it will join the already announced 1964 Porsche 901 Cabriolet Prototype (estimate €850.000-€1.000.000) and a 1970 Porsche 917/10 Prototype (estimate €4,600,000-€5,500,000). In all, 25 Porsches will be on offer at the RM Sotheby’s Paris 2017 sale. Porsches have been selling very well and in high numbers at recent auctions. RM Sotheby’s had some remarkable successes with Porsche cars selling high above estimates in 2016 at the London Sale (1995 Porsche 911 GT2 sold for $2,476,300) and Duemila Ruote sale (1996 Porsche 993 GT2 sold for €616,000 – one of 60 Porsches on offer at this huge auction). 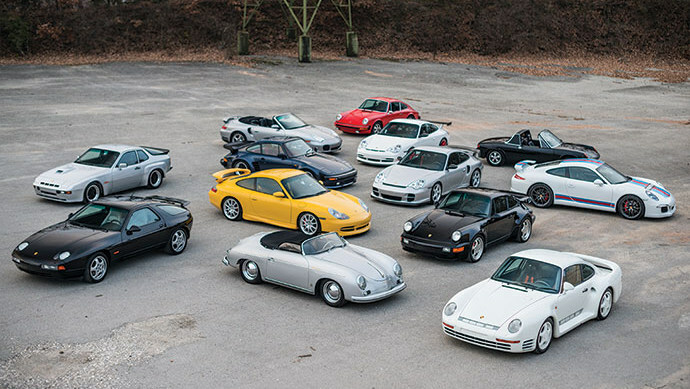 “RM is really changing the game for presenting and selling Porsches at auction. We’re both thrilled and honoured to have been entrusted with this incredible group of cars and can’t wait to bring them to auction in the coming months, starting in Paris,” says Oliver Camelin, Car Specialist, RM Sotheby’s, and a lifelong Porsche enthusiast. The 1988 Porsche 959 Sport (Est. €1.500.000-€2.000.000) is the most expensive of the Swiss Porsche collection cars on offer at the RM Sotheby’s 2017 Paris auction. This highly original 1988 Porsche 959 Sport, the pinnacle of Porsche performance and technology in the ‘80s, is without question, a headline attraction of the collection. Having just three owners from new and covering only 11,281 miles in its near 30-year life, this 959 Sport was purchased new by California Porsche dealer and racer Vasek Polak, who picked the car up personally from Stuttgart and drove it around Europe before returning to America. It retains its original factory fitted seats with racing-style harnesses, rear seat delete, leather-wrapped roll bar and upgraded suspension, all 959 Sport-specific upgrades. One of just 29 examples of its kind, this 959 recently spent six months at Stuttgart’s Porsche museum as part of a special exhibit of Porsche supercars, and comes to Paris in exceptionally original condition. This car is estimated at least half a million higher than standard 959 Komfort versions. Spooling up the turbos amongst the collection is a 1994 Porsche 911 Turbo S 3.6 (Est. €650.000-€750.000), which is already causing a stir. One of just 17 built and with an estimated 385bhp on tap, Porsche turned the volume to 11 when they created this example in the late ‘90s. Using the remaining Turbo chassis at the end of the 964 production run in 1994, Porsche Exlusiv produced the special Turbo 3.6 S and sold it to their most important clients. Most Porsche 911 Turbo S 3.6 cars were specified with the slant-nose ‘Flachbau’ option, with just 17 specifying the traditional-look ‘Package’ body, this example included. Showing just under 23,000 miles and completed in sinister Black over Black, it remains ready for further road use. The collection also features a pair of desirable modern-era, Metzger-powered 996s. The first is a delivery mileage 2004 Porsche 911 GT3 RS (Est. €200.000–€250.000) finished in Carrera White with red decals. Regarded by many to be the first track-orientated Rennsport (RS) road cars of the modern era, it is also one of the rarest Porsches ever made. A highly collectible example, the featured GT3 RS was purchased new by the vendor and comes to market in immaculate condition, having been driven only 196 kilometers from new. It is one of very few examples to exist in this ‘as-new’ condition and with such low mileage. Lining up alongside the RS is a 2004 Porsche 911 GT2 Clubsport (Est. €175.000–€225.000), the most powerful variant of the 996-generation 911, with more horsepower than the Turbo and rear-wheel drive instead of all-wheel-drive. The featured example, one of only 70 completed as a desirable Clubsport version, is powered by a six-cylinder, twin-turbocharged engine producing an impressive 483bhp, and enjoys further weight savings over the Mk I version, making it an exciting driver. Finished in traditional Silver over Black, it comes to market sporting just 24,000 kilometers from new. The additional 29 vehicles from the private Swiss collection will be presented across various global RM sales in 2017, including the company’s well established Amelia Island, Monterey and London auctions. Gooding also announced four high-performance Porsche supercars for its Amelia Island 2017 auction.